This is Bone Vol. 9: Crown of Horns. It's full-fledged war as Briar, the rat creatures, and the Pawan army storm the city of Atheia. The Bone cousins, Thorn, and Gran'ma Ben are all there to defend the Valley and stop the return of the Lord of the Locusts. When Thorn goes inside a ghost circle, she hears a voice urging her to seek the Crown of Horns. 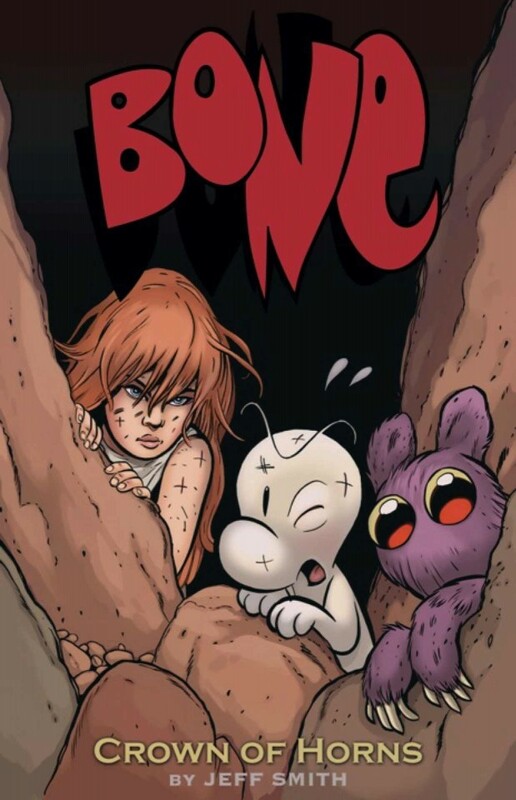 What follows is another dangerous journey for Thorn and loyal Fone Bone as they race to the sacred grounds of the dragons, searching for the one thing that may save them all. This is the breathtaking conclusion to Jeff Smith's nine-book graphic novel series.